I bet you’ve heard all these tips already. And you know what? I'll make you a deal! If you go through the list and find even a single tip you haven't heard before -> email us. We may have a small reward for you. It's a fun little game we like to play. Unless you've been living under a rock, you already know the core principles to fitness. But you probably didn’t realize skipping them was REDUCING your progress by more than 85%. But don't take my word for it. Extensive research and anecdotal evidence all confirm the importance of what I'm about to share with you. Let's go over each point on our list. #1 How Does Sleep Help With Weight Loss & Muscle Building? All that can directly or indirectly render your fitness efforts futile. Sleep should be your top priority. Not only it helps you stay in shape, but also crush it in EVERY other area of your life. Pulling a single all-nigher lowers your cognitive skills to that of a drunk person. Even reducing sleep time to 6 hrs can trigger all the negative effects listed above . Sleep deprivation and dieting don't mix well. Poor sleep results in increased hunger and cravings. At the same time, your willpower takes a massive hit. How Do You Manage Sleep? Make sure you get around 8 hrs of uninterrupted sleep a night. If your sleep was chronically poor you may need more than that. A lot of people accumulate a lot of sleep debt. They may initially need a few (or more) days of 9 to 10 hrs. #2 Stop Cheating! How to Avoid Food Cravings? Most people who manage to lose weight fast have one thing in common. They optimized their immediate environment to support healthy eating. Most individuals try to get in shape through sheer effort, dedication, and willpower. That’s rarely sustainable. What do you think will happen when you have a bad day? Or maybe you’re so drained your willpower and motivation are down to ZERO. It’s key to organize your environment so it supports your habits, not work against you. You don’t want your kitchen to resemble a pirate island. In the sense, you have hidden (high-calorie) treasures everywhere. There’s NO risk of you popping open a jumbo-sized bag of chips at 2 am IF you never bought it in the first place. How Do You Optimize Your Environment to Support Your Diet Goals? Get rid any temptations at home and your workplace. Fill your kitchen with healthy wholefood alternatives. This naturally helps you improve the quality of your diet . Realize your willpower will eventually fail you. Then your environment dictates what happens. Let your surroundings support you. Either by making “bad” choices impossible, or making “good” choices the default. #3 Should You Start Calorie Tracking / Food Logging? Did you know we (humans) are notoriously bad at estimating how much we eat? One research paper shows we underestimate how much we eat by up to 63% . There’s also the fact we tend to completely forget to account for extra snacks consumed. Do you go out driving in the dark with your lights off? Why would you try to wing your diet then? We didn’t evolve to thrive in a world where food is abundant. The human brain is not capable at accurately measuring portion sizes to keep your lean. That’s one of the main reasons how you get out of shape. 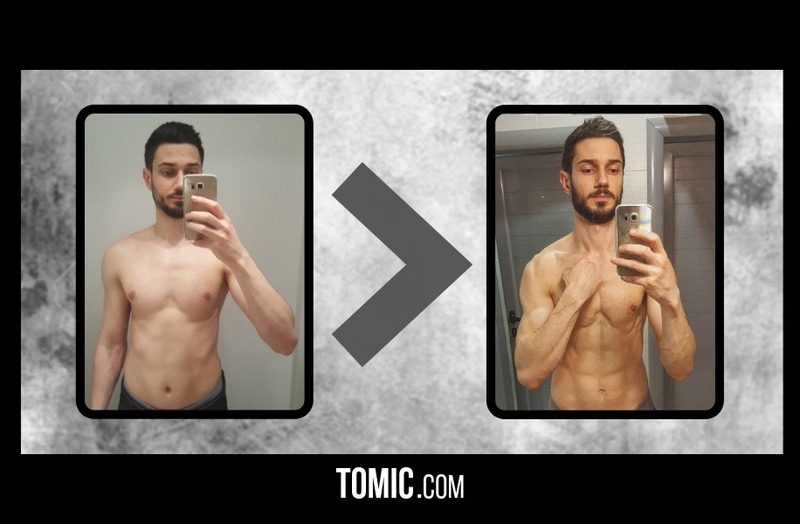 How to Eat Less and Finally Get Abs? Most people don't realize how much junk food they consume. Knowledge is power. Based on the data, you can easily see if you’re overeating. Then reduce the number and/or size of meals if needed. Working with a coach can also save you a ton of time. He can help define clear food and calorie targets. This way you eliminate errors due to lack of knowledge or sub-par tracking. #4 How Much Cardio You Need to Get Ripped? A lot of people think you need few HIIT sessions a week to lose weight. Some think 2-3 cardio sessions are enough to see those abs. Not only this is far from the only way, but often sub-optimal. You can stay active by simply taking a couple of 20-30 min walks a day. This is one of the key habits to getting lean fast. There's a small difference between calories burned during typical cardio session and taking a walk . But the compound weekly effect of daily walks is much greater than that of 3-4 cardio sessions. This is especially true if you work in an office. A couple of cardio sessions won’t do much for you. You need to keep your activity up every day. The human body evolved to move. Walking is one of the most natural ways to stay active. Not only it bumps calorie expenditure (fat burning), but it keeps you healthy. Most people underestimate how much calories you burn walking. One hour a day can be 2-3x more effective than doing cardio a few times a week. It also keeps blood (hence nutrient) flow to all parts of the body at optimal levels. This helps recovery and injury prevention. Doing cardio in the gym and not going much outside won't get you the same benefits as walking. #5 How Much Time You Need to Spend in the Gym? “You are the average of the 5 people you spend most of your time”. It's vital to surround yourself with people who reinforce the habits you’re trying to cultivate. It's not about what happens in the gym. Those are just a couple of hours of your whole day. It's important with whom and how you spend your time the rest of the time. You shouldn’t start ignoring all your friends out of a sudden. Just be more careful who and to what extent influences your decisions. We’re hyper-social beings. We tend to pick up the habits and mannerisms of other people. It happens subconsciously. Surround yourself with people who train and eat healthy. The idea is so simple, but yet one of the most effective tricks to get lean fast. This is why children of obese parents are likely to develop unhealthy eating habits and exercise less. You can even look at a group of close friends. It's rare for one of them to exhibit behavior too extreme than the group norm. How Do You Cultivate Healthy Habits? Make friends with people who are already leading the lifestyle you strive for. Spend more time with them. Not just in the gym, but outside the weight room as well. You’ll soon get “brainwashed” into leading a better, healthier lifestyle. What if NONE of Your Friends Leads a Healthy Lifestyle? What if everyone you know is out of shape? Then how do you benefit from positive peer exposure? Exposure still works. The same way you can become vegan after learning about animal suffering from TV and YouTube. Or you can give up/embrace religion by reading books. Most people spend as much (if not MORE) time on social media, YouTube, and watching TV. You can consciously organize your news feed, and what pages/channels you subscribe to. Bias your selection towards the goal you're trying to achieve. How Do You Leverage Social Media to Achieve Your Fitness Goals? Get rid of all those funny cat videos. Populate your feed with half-naked men huffing and puffing their way to iron glory. Your brain can’t tell the difference between reality and the internet. If you’re bombarded with gym videos and healthy recipes, the brain accepts that as the norm. It will rewire itself to start exhibiting that same behavior as well. Don’t underestimate the power of selective “follow” and “unfollow”! Facebook groups and masterminds are other great places to receive support and reinforce healthy habits.